Hello friends! 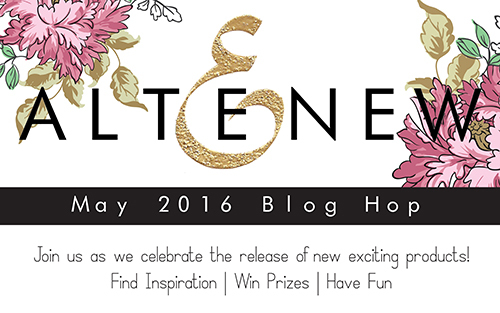 This post is a part of Altenew May 2016 Release Blog Hop (more on that below). Whenever I make cards (no matter the occasion) I prefer using quotes instead of simple sentiments. Luckily, Altenew has a few sets with beautiful quotes and today they are releasing an additional one called “Sentiments – Beautiful Quotes“. 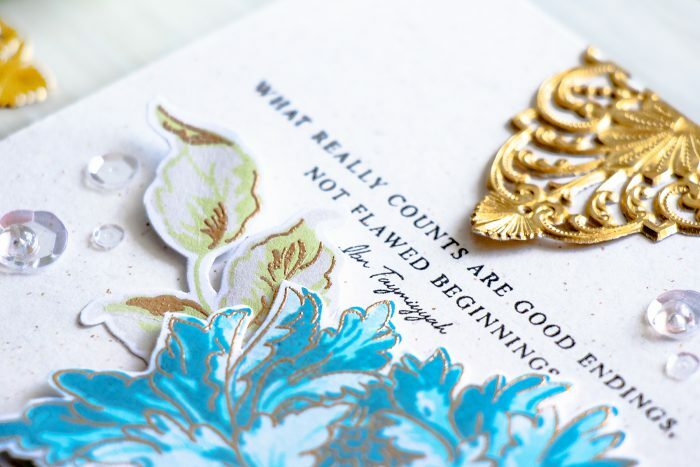 For the card I’m featuring today I stamped “What Really Counts Are Good Endings, Not Flawed Beginnings” in black ink directly onto Spicy Yogurt card base. I think this is such a true and beautiful quote and I can see using it often on encouragement cards. I am also featuring one of the new multi-layer (or color layering) floral stamp sets – “Floral – Majestic Bloom“. Its a large 6×8” set that allows you to stamp one large stunning flower and a few leaves. 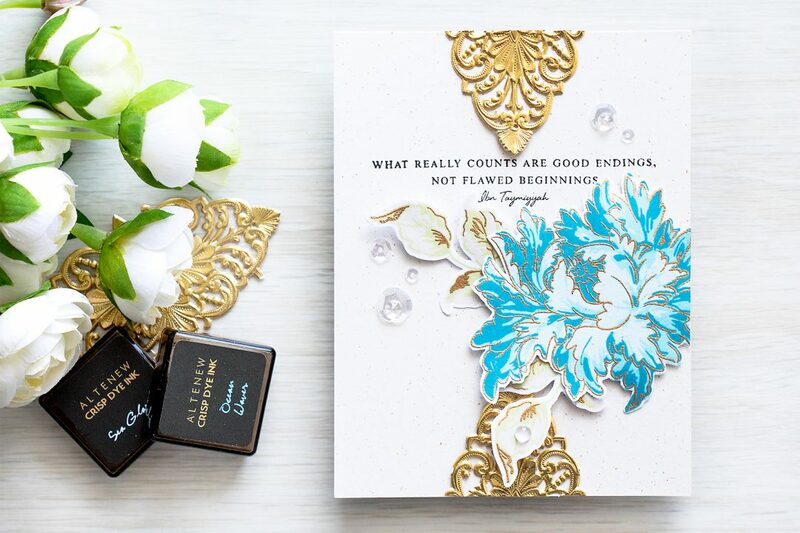 The flower was created by first heat embossing its outline in Brass embossing powder and then stamping the layers (they were all double stamped with the help of MISTI using inks from the Cool Summer Night set). I used the same approach for the leaves, as for the colors I went with lightest gray and lightest green. I also added one of the stunning Antique Trims to the top and bottom part of my card and embellished it using clear sequins and drops. Join us for a blog hop filed with lots of creative inspiration and fabulous prizes! The hop starts on Altenew Blog, if you arrived from Therese Calvird you are on the right track as I am the last stop on this hop. To celebrate this release, Altenew is giving away $50 gift certificate to THREE lucky winners! Please leave a comment on the Altenew blog by Thursday, May 19, 11:59pm EST for a chance to win. The winners will be announced on Friday, May 20. I also have one $30 certificate to give away to a lucky reader! Please leave a comment on this blog post by Thursday, May 19, 11:59pm EST for a chance to win. I’ll announce the winner in this blog post on the 20th. And I will also contact the winner. Winner is: Barb Macaskill! Congratulations, Barb! I’ll be in touch! WOW, as usual Yana, a very gorgeous card ! I love the combination of gold and blue colors ! So, so beautiful ! Thanks for sharing. Goodness – this card is just so elegant and beautiful! Wow, I love the touch of gold on this card — it really takes it up to the next level! Lovely job! Love the quote. Beautiful card. Absolutely beautiful!!. What a great blog hop this has been!!. So inspiring!!. Love all the flowers carried by Altenew!!!. I love the embossing as a layeR! Totally gorgeous. A very elegant card. Amazing card I love the elegance of the different elements all together. Omg, this is so beautuful. I love it. Thanks for sharing such and inspirational card. Love your creations. What a gorgeous card! Your cards always are lovely though. I love your card! The card is so pretty! Love the quotes! What a great card! I love the quote! 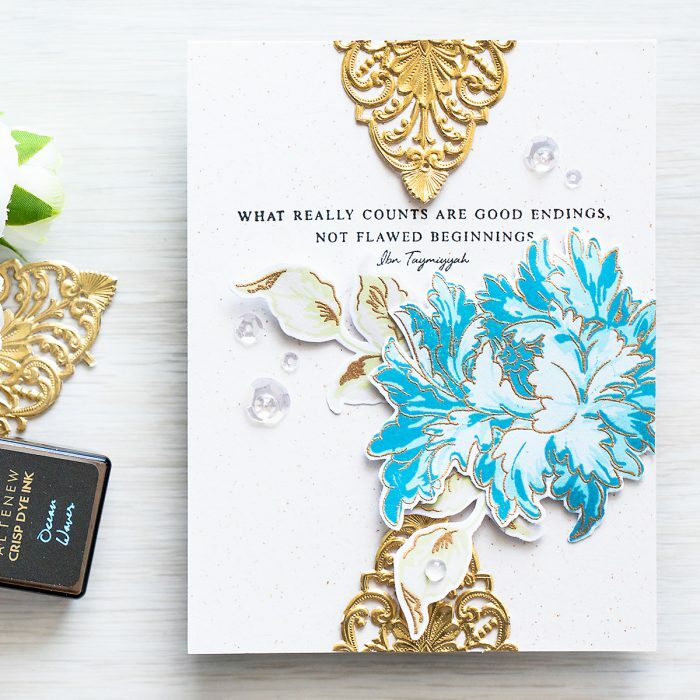 very elegant card – love your colors and design and the gold embellishments tops it all! love how you have used these images..beautiful cards!!! thanks for sharing your art! always inspiring to see your work..
WOW… Yana, this card is gorgeous and elegant. Love the touch of gold . Beautiful, stylish card ! I like the combination of the brass embossing and the colours ! And a big thank you for the great giveaway and a chance to win. Good luck to all of us ! I love all the new release stamp set. My favorites so far! Yana, your card is simply divine! Hate to see the hop end as I’ve enjoyed seeing the new goodies in action. All the cards I have seen of yours are so very elegant! You have that special touch! I just wish you had a video. I’m going to look you up on YouTube. TFS!!!! Love how the gold embossing powder looks in combination with blue inks ! wonderful ! i need too try this too! Majestic Bloom is my favorite set in this release. Love your inspiration card. Love the colors and the touches of gold are so beautiful! You had me at gold and blue!! A fantabulous color combination and the image is delightful!! The Majestic Blooms are a wonderful set!!! TFS! What a gorgeous card. That blue is so lush and the gold so elegant. Just lovely all around! Beautiful card! This is a gorgeous release! What an elegant card Yana! I am swoon by the beautiful card! How can I comment on this post and not have a duplicate comment? This is just a trail comment but I wanted to say that your card is beyond words..it is utterly beautiful!! Another gorgeous card! Love the gold and blue together! So pretty, thank you for sharing! Only a few more hours to share how much I love these cards! SO BEAUTIFUL! love ..love the card..its so pretty..!! Love this wonderful card! The gold adds so much! Such a lovely and elegant card!! So beautiful! That flower looks brilliant in blue. Wooohoooo! So excited to see my name! Thank you so much! WOW – you’ve been super lucky on this blog hop => HAPPY Shopping!! !